Two Millersville graduates look to take old, wooden furniture and return it to a pristine state. Wooden furniture has an appeal to many, offering comfort, beauty and a value of timelessness that can be found in countless homes. It’s especially evident right here in Lancaster County, with numerous small businesses established by craftsman and the Amish. However, wooden furniture can break down and fall apart without proper care, leaving owners to get rid of their pieces. While these things may happen, you don’t always have to get rid of broken down furniture. Recently, two Millersville University graduates have established their own restoration business in attempt to breathe life back into people’s prized possessions. Aaron and Krista Guhl of Jacobus, PA, started Honeywood Restorations after their cat damaged the leg of a chair. The leg was so damaged that Aaron had to fully refinish the chair rather than patch it up. After the chair was refinished, the couple purchased furniture from garage sales to improve their skills. It was then that they decided to make this a full-fledged project and sell their work. Honeywood Restorations takes pride in the beat up, worn down pieces of furniture that people may believe are beyond repair. Rather than having someone get rid of a piece or throw it out, they will take it in, restore it to its former glory, or perhaps make a new piece that can be used for decades to come. The Guhl’s have taken on a variety of projects since the business started and aren’t afraid of trying to work on something they haven’t touched before. 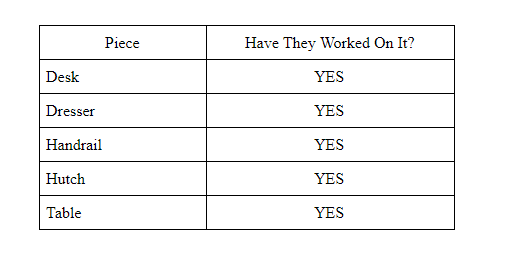 Table detailing what Honeywood Restorations has worked on. The couple take turns with their projects, both tackling the refinishing and restoration portions of their assignment. 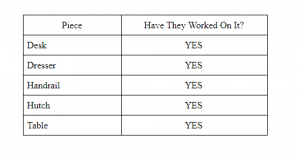 They’ll even assign specific jobs to themselves to make the process a little bit easier. While The Guhl’s want to make sure their clients receive their furniture back as quickly as possible, they believe patience is key when it comes to finishing a piece. Honeywood was given a scratched Duncan Phyfe style drop leaf table. The table is believed to have been made in the 1940’s. Photo provided by Shane Garcia. After the scratches were taken away, the beauty begins to show. Photo provided by Shane Garcia. 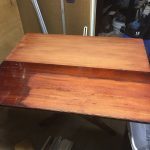 The refurbished table was given a fresh coat of stain. Photo taken under halogen lights. Photo provided by Shane Garcia. After the stain was applied, the table was left to dry. Photo provided by Shane Garcia. Not only does Honeywood restore furniture that may be deemed unworthy, the Guhl’s do their part to make sure the materials and methods they use are beneficial for the environment. Krista’s father set up small solar panels at their house for the benefit of power and electricity. When operating their equipment, the Guhl’s run off the solar panels so they save the electricity. Their biggest expense would come from operating lights and sanders, so the solar panels help to cut down on the power use. While using chemicals is an integral part of refinishing wood, the Guhl’s try to use them sparingly. Chemicals can not only burn flesh and cause toxic fumes, but they can also do damage to the environment. Aaron and Krista use light coats of a biodegradable finish stripper that can maneuver it’s way through layers of finishing and present an appealing finished product. These sustainability methods are not only helping to save the environment, but it also allows Honeywood save money, acquire materials of greater quality, and finish pieces to the highest caliber. What kind of polish does Honeywood Apply? Honeywood Restorations applies a homemade beeswax polish to their projects before they send them home to their clients. The polish is made up of boiled linseed oil, turpentine, and of course, beeswax. The turpentine and linseed oil gives off a lemony, citrus smell, while the beeswax by itself smells like honey. 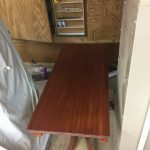 When all put together and the linseed oil and turpentine evaporate, the polish has a nice honey scent when applied, much different than any polish you may buy at a hardware store. The beeswax polish is combined with a wax polish when applied to the furniture, giving the piece extra protection and a beautiful luster. Refinishing a piece of wooden furniture can breathe new life into any object. Whether the piece needs a touch-up or perhaps it needs to be completely redone, refinishing can bring the natural beauty back to your cherished item. However, if your wooden furniture is considered to be a rarity or an antique, consider not getting it refinished. Refinishing an antique piece could potentially drop the future value of the furniture you may have. 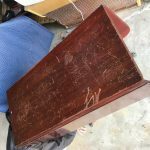 It is considered best to leave antique furniture in its natural state, as any marks and scruffs may determine the date of your piece and just how much it may be valued. Honeywood Restorations may be recently established, but thanks to word of mouth and social media posts, the business has been booked since October with projects through the new year. Customer satisfaction has boosted their pride and driven the couple to be more active and crafty. As time goes on, Honeywood Restorations will continue to work away and make sure every customer walks away with a smile on their face. If you would like to learn more or contact Honeywood Restorations, please visit https://honeywoodco.wixsite.com/home. Aaron Guhl is a 2015 graduate of Millersville University, majoring in Psychology. After graduation, Guhl worked as behavioral health personal care assistant with children in Chester County. Unfortunately, he suffered a back injury during his time on staff and had to leave his occupation. Although he is no longer working in the psychology field, Aaron does apply his trade to his work. Guhl takes time out to know his clients; matching the client’s personality with the piece he is working on. If a customer is quirky, he’ll add character to the piece. If they are more reserved, he’ll make sure the product is traditional. “Amish Furniture Stores in Lancaster County, PA.” LancasterPA.com, lancasterpa.com/amish-furniture/. Wiggins, Pamela. “Restoring Antique Furniture: Should You or Shouldn’t You?” The Spruce, 4 Apr. 2017, www.thespruce.com/restore-or-not-antique-furniture-148809.